When I needed to purchase a USB keyboard for my Mac mini, I settled on a used Macally iKey, knowing that the product had a history of problems. It's the luck of the draw when you get an iKey - some work fine, others may repeat key strokes or have problems with their USB ports. My iKey worked fine for about a week, and then the "A" and "E" keys began to activate twice on some strokes. Since my first typing experiences were on an old 1950s vintage Royal mechanical typewriter, I may pound harder on a keyboard than I need to. This could be forcing some of the iKey's switches to travel farther downward than they should, turning them off and then on again as they move upward, so my typing style (or lack of it) could have accelerated a defect that would have occurred eventually anyway. Of course, this is only an uneducated guess. Since I didn't feel like I should have to adjust my typing habits to accommodate a flaky used keyboard, I decided it was time for a change. The disappointing thing about the iKey was that it really worked for me. It had the same layout and spacing as the old Apple Extended and Apple Design ADB keyboards and felt comfortable to use. I wanted something very similar - but obviously without any defects. Price was also an important factor. I settled on Kensington's Keyboard-in-a-Box USB and ordered one from Amazon.com at a total cost of $25.64 with free "Super Saver" shipping. The first thing I noticed about the Kensington keyboard was its lightness. It's much lighter than the iKey and Apple's old ADB keyboards. It's also quite thin and more compact, due to the placement of the function keys right above the top row of keys with no space in between. The case is transparent smoke gray, and the keys are absolutely black with stark white lettering. This makes them very visible. A wrist rest is included and is very easy to attach if you want to use it. Two auxiliary USB ports are recessed into the upper ends. 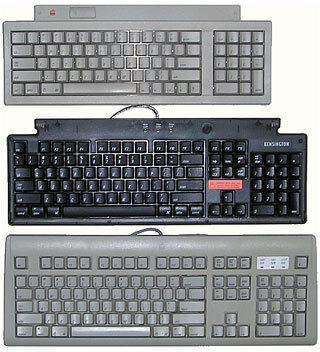 Because of the location of the function keys, the Keyboard-in-a-Box (center) is only slightly deeper than the old Apple Keyboard II (top), which had no function keys. Its layout is nearly identical to the Apple Design Keyboard (bottom), but its length is slightly shorter due to the key spacing being imperceptibly tighter. This makes the total key area about 3/8" shorter overall. This is not likely to be noticeable even by strict touch typists and makes for a compact but fully functional keyboard. When I set it down on my desk, a problem became apparent. The keyboard rocked diagonally on two of its corners. It was about 1/4" off the desk at the high corner. After verifying that my desk was completely flat and considering the problem for a few seconds, I unceremoniously grabbed the board at both ends and gave it a firm flex in the opposite direction of its twist. It didn't break, and I got the crude adjustment right in the first try. The keyboard now sits flat on all of its feet. When I asked Kensington's support representative about the problem, he indicated that this particular defect had not been reported before now. I'm not certain if it's more disturbing that the product shipped with this irregularity or that I could easily fix it the way I did. At any rate, the Keyboard-in-a-Box doesn't win any points for sturdiness. This could make it a poor choice for travel. I plugged the keyboard into a vacant slot in my USB hub and booted the Mac mini. The OS requested two key strokes and then recognized the 'board. The pressure required for a key stroke on this keyboard is less than on Apple's ADB 'boards and similar to the iKey. However, the keys don't bottom out quite as softly as the keys on the other boards. The board also flexes slightly with each stroke, but I'm fairly heavy handed. Nonetheless, I didn't find it unpleasant to type with. After two weeks, I had used the Keyboard-in-a-Box for writing and updating several web pages, emailing, and writing two articles for Low End Mac. It performed flawlessly and continues to do so. If it bothers you that you may have to risk adjusting the flatness of a new keyboard as described above, or if you need a rugged keyboard for travel, the Kensington Keyboard-in-a-Box is probably not for you. However, if you're looking for a light duty, economical, compact USB keyboard with all of the functions of Apple's ADB 'boards, Kensington's Keyboard-in-a-Box should fit the bill nicely. It works for me.